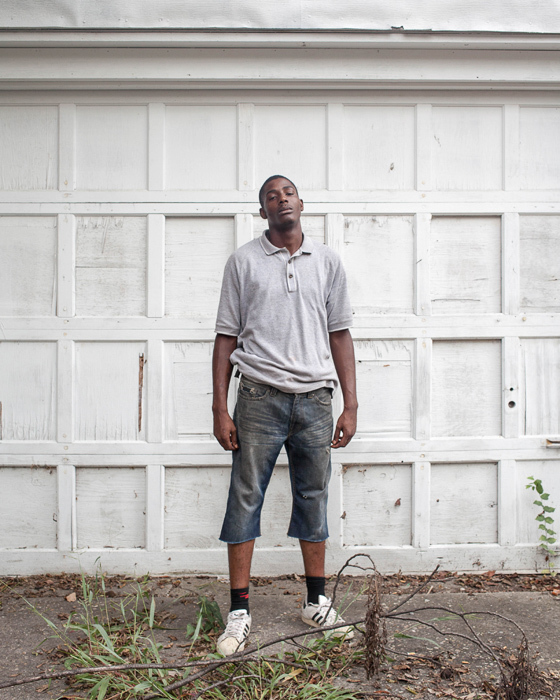 D’Angelo Lovell Wiilliams is an Art Photography MFA candidate at Syracuse University. D’Angelo is originally from Jackson, Mississippi and he received a BFA from Memphis College of Art. Working primarily in photography, D’Angelo has studied many art mediums and is fond of making something tangible. While completing his BFA, he worked on two series A Brother Unfamiliar and Beauty Kings. D’Angelo and I were able to discuss both of these projects, the social expectations of black male identity, and how his experiences of feeling “othered” growing up, informs his images. Zora J Murff: How did you come to be a photographer? D’AngeIo Lovell Williams: I attended a visual and performing arts school from 4th grade to my senior year in high school. During these years, I was mainly studying other mediums, like painting, ceramics, printmaking, and drawing. I was good at those, but they took too long, and I wasn’t very patient back then. I was a sophomore in high school when I took my first analog photography class. I wasn't that good at developing pictures, but I loved taking them. When my mom bought a pastel pink Kodak point-and-shoot for herself, I took it. I was serious enough to start making more conceptual work with the camera, creating surreal images of my friends in alternate realities. Dream-worlds that were inspired by films, music, and fashion magazine spreads. I was using photographic means to portray what I didn’t see on a daily basis. That was more than likely due to the fact that I was unacquainted with the reality of my surroundings. I couldn’t explore them, because I didn’t have the freedom to do so alone. For that reason, I overlooked the idea of exploring the city of Jackson, as a photographer, when I actually became interested in photography. ZJM: Tell me a bit about your series A Brother Unfamiliar. DLW: A Brother Unfamiliar was the body of work that led to Beauty Kings. I began A Brother Unfamiliar outside of the work that I was producing for my photo classes. It was the last semester of my junior year and I was in a social documentary sequencing class where the first assignment was to go somewhere, photograph strangers, and eventually find a group or lifestyle to document. The year prior, I had met photographer Whitten Sabbatini who had recently moved to Memphis and was working on his series There’s Worse Things Than Being Alone. He was photographing strangers in the Black community and inspired me to do so. I began going out into unfamiliar neighborhoods in predominantly black areas of Memphis to start making my own images of strangers. A Brother Unfamiliar was my way of getting to connect with black men, the way I wanted to. I wanted them off-guard and isolated. The way I went about finding people and photographing was simple. I would bike or walk around for hours, looking for strangers who fit into their surroundings. Getting an image wasn’t always so simple. Thankfully, my friends and my first job made me more sociable, making it less challenging to talk to and photograph strangers. When it came time to start researching for my senior thesis, I decided to bring these images into my critique sessions. It was the first time any one of my classmates or professors really saw the work and talked about it. ZJM: You state that you felt like an outsider when it came to your own culture and race. Can you speak about what it means to you to be a black male, and how it felt not to conform to the socially-expected norms? 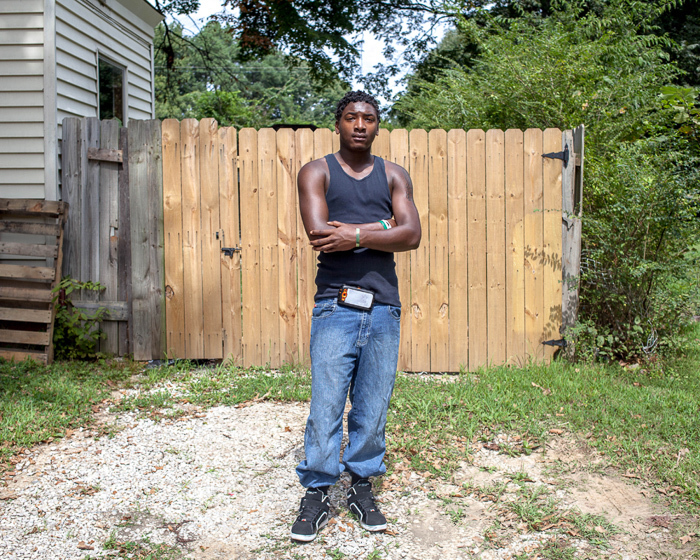 DLW: Photographing Black men and women made me realize that I had a lack of a connection with my own race and culture, even though I was raised in some of the same types of neighborhoods, school systems, and shared the same cultural background. The Southern culture barely resonated with me. Of course I knew I was a Black male, but there’s this thing where a lot of idealisms are placed on men, black males especially, that I did not feel the need to be proud of. I didn’t feel like they were a part of me to begin with. My reasons for making much of the work that I make is definitely a result of being gay and having a disconnect between myself and many other black males, what is expected of black men, and what I experienced growing up. There were times that I didn’t feel “black enough”. Sometimes, I didn’t want to be “black enough”. I didn’t see it as a setback, but I wasn’t benefitting from being black in the way that people normally see black people benefitting from being black. You’re looked at differently when people don’t feel you’re one of them or don’t like the same things as them. That was my case. I was this round, un-athletic, black boy, with green eyes, walking around, looking “other.” I’d even go so far as to say “black enough” also means “masculine enough.” I was, randomly, mistaken for a girl when I was younger, but very often, even in high school and at the restaurant I worked at. I was so self-conscious. I was trying to be happy. I didn’t think I was better than anyone. I ended up conforming. I would wear name brand clothing and shoes like the guys around me. I got braids and twists in my hair. I even danced the same as them. That way, they wouldn’t talk about how my body looked, my eye color, or say anything I did was gay. I would have been devastated to have someone actually know that I was gay in grade school. I didn’t come out until three years into college and I’m still not done. I saw how boys treated the only gay boy who was out. I had a few male best friends growing up and they were all artists. I didn’t have anything to worry about with them. It’s easy to say conforming is a cop-out. But when you feel like the only drop of sand next to the fire, you know you can’t put it out. You want to become one of the flames. I just want to tell people to be themselves in the safest way possible. I have a quote that I say: “You like what you like”. I try to live by it. ZJM: You also state that you felt “othered” by your father’s absence. Do you think him being around while you grew up may have changed your experience as a black male? DLW: I don’t think my experience would have been any different. If he was the one person that was supposed to tell me to be like the other black males I grew up around, I still wouldn’t have listened. I wasn’t around my father often when I was younger, but I was around sporadically enough to see what kind of man he was. It seemed like he could not have been the same type of parent that raised the guys that I couldn’t identify with in school. I wasn’t able to realize or even understand this when I was younger. Then he went to prison for a few years in the late 90s. I didn’t see him for a while after that. Father figures came and went throughout my household. My mom was dating, so there were father figures around during much of my adolescence. However, that didn’t help me understand anything I was dealing with. I was continuously creating my own view of what a man should be. There was even a high school foreign exchange student from Azerbaijan who lived with us for a year. His view was more expansive than mine and my mom’s put together. We had never left the South. He was basically the older brother I never had and brought an alternate perspective of masculinity in my life. ZJM: In your series, Beauty Kings, you’re working with photographing strangers, but you’ve started wrapping their head in a velvet cloth. DLW: I decided to incorporate different ways of photographing these strangers and it became more difficult to do so with them. I tried making self-portraits where I switched clothes with the strangers. I was close to getting these images with one guy in my clothes and me in his. But his ride came to pick him up as soon as we were about to photograph. I then wanted to try to emasculate them in a way. But I had to think about what I was really doing. I was using a simple piece of cloth in a way that resembled head-wraps, headdresses, and turbans. Wrapping cloth around the head has different meanings and uses across different cultural backgrounds, and both positive and negative connotations have been applied to this act. You can’t escape the signifiers that people place on any of them, once you’re aware. Head wraps were also used as a fashion statement among women. African kings and queens wore head wraps and patterned headdresses, and clothing. I wanted to use beauty and some positive context in the way that I approached making the images and using the material. ZJM: How did your subjects respond to you wrapping their head? Do you think this closeness allowed you to connect with them on a different level? DLW: Many of the guys I met did not want to commit. Among the reactions that I got were: “Oh that’s cool, but I can’t do that.”, “Nah, man. We don’t do that around here.”, and a lot of “Hell no’s.” I felt like I was wasting my time. So I decided to reconnect and spend more to with the black men that I knew already or was getting to know. I had a method that was more comfortable to use with my friends, but this act was definitely an intimate experience to have, regardless. It was an adornment with a lot to say based on who it was on. I connected on a higher level with the strangers, because I didn’t know them and it was great for the sake of the work. The images of strangers definitely have a look and feel, not necessarily a better one, but one that the images of my friends don’t have. The interaction with the men that I did know was better because, they didn’t make me feel like I wasn’t one of them. Many of these men that I knew were also artists and creatives. They understood what I was doing in a way that the strangers didn’t. The process, altogether, reaffirmed the idea that the many black men cared a lot about how people viewed their masculinity. ZJM: Do you think images can serve to break down cultural barriers? DLW: I think it all comes down to having certain perspectives as an image-maker, of any kind, and having the right people in the right places see your images. It helps to be educated on ways we can go about doing so. Organizations like SPE offer platforms for Women, LGBTQI members, and photographers of multicultural backgrounds to showcase their work. It’s not just about showing work made from the minority perspective, but also showing work focusing on these marginalized groups to be discussed. Images start discussions. It is one thing to tell people, “something is there”, but showing those realities, or alternate realities, gives viewers something concrete. I think images are capable of so much. They make people aware that there are problems all across the globe, even when the actual images are not about the problem. ZJM: Do you think you will continue making this type of work? DLW: In some ways, yes. I can’t escape what I know. I can always experience more, and do more. That’s what changes how I make work. I like using the old and making something new. I’m at a point where I’m trying to figure out what works for me and sticking to it. DLW: I just moved to New York in August where I’m currently pursuing an MFA in Art Photography at Syracuse University. Can’t you see? I’m steadily moving closer to the North Pole! Seriously, though, I’m devoted to making even more thoughtful and provocative pictures during my time in Syracuse for the next three years. In between that, I’m always open to new experiences. To view more of D'Angelo's work, please visit his website.